We may be biased, but diamond jewelry is a great idea. Oh, Valentine’s Day. How can a day that’s meant to be about love end up being so stressful? Of course, it doesn’t have to be. The perfect gift could be flowers and chocolate, cooking a nice dinner, or even cleaning the house. But sometimes you need to go that extra step to really sweep her off her feet. And I can’t think of a better way to do that than with diamond jewelry. Now, unless you’re thinking along the lines of our final recommendation (no pressure), I definitely recommend keeping the gifted piece simple, elegant and timeless. This is always my preferred route for surprise jewelry, unless you have a clear idea of a unique style she would love. There is also no need to break the bank for a “just because I love you” Valentine’s Day gift… unless you want to of course. Starting from the ears and working our way down. Where else would we start? Diamond stud earrings are a versatile, classic and modern addition to any outfit. They can be worn 24/7, are comfortable and, no matter the size, they always look great. This is one of the great things about diamond stud earrings; you can create a pair for almost any budget. Style: The classic style is a 4-prong diamond stud earring, but there are endless options, including 3-prong “martini” style studs, studs with a diamond halo around them and perhaps a pair of bezel set diamond studs. These all work well, and are worth considering if you know her style calls for it. Metal: When it comes to the metal to be used, definitely opt for white gold or platinum, unless she wears exclusively yellow gold or has a stated preference toward it. For the most part, 14k white gold will work well here as there’s not a lot of wear and tear on these pieces. We also make diamond stud earrings in 18k white gold or platinum, if you are looking for something more. Shape: The most common diamond shapes used for earrings are round and princess cuts, but of course any diamond shape would work beautifully. Clarity: With diamond earrings, it is common to use a lower clarity diamond (such as I1), as the diamonds are not usually looked at too closely or for a long period of time. This also allows you to maximize the size of the diamonds and can work well if the diamonds have nice, white and well placed inclusions. My preference is to stick to the eye-clean clarity range, being SI2 or above, to make sure they really shine. Colour: As far as colour goes, keep as close to white as possible. I+ colour is best in my opinion. Confused? Check out our diamond education section for further explanation on any of the above terminology. A neckline like that deserves some attention. If she already owns a pair of diamond stud earrings, a necklace is a great option that can easily compliment her day-to-day jewelry. As with earrings, you can make a necklace for almost every budget. The classic option is a diamond solitaire pendant. This can be made from any diamond shape but is typically round or princess cut. If she has a pair of diamond earrings she wears all the time then match them in shape (unless you know there’s something else she’s been dreaming of). 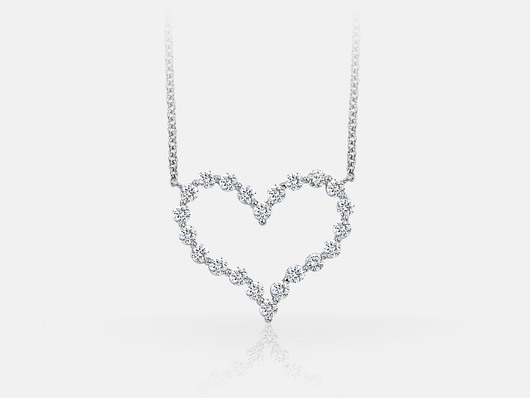 Other options for a necklace include a pendant with a halo around it, a bezel set diamond pendant, or perhaps a bezel set diamond “floating” on the chain. If you really want to go all out this Valentine’s Day, you can always go for more than one diamond. Two, three… or how about 95? A beautiful “tennis” or “riviera” style necklace is essentially a string of diamonds and can be graduated in the sizes used (larger at the bottom and smaller as the strand goes up and around the neck) or can be a uniform size across. Tempting, isn’t it? Our diamond quality recommendations for necklaces are very similar to those for earrings, but as you spend more on the necklace (and especially if you are going for an option with multiple diamonds) we recommend leaning toward the nicer categories. A necklace is front and centre after all. If her ring finger is bare… and you’re ready for it. Finally, Valentine’s Day might be the perfect time to take your relationship to the next level. She might only be expecting flowers and chocolate, but imagine her reaction when she gets a commitment from you like no other? We are always here to meet with you to discuss all the options you have for this most precious of diamond jewelry gifts. Wishing you and your loved one a very special Valentine’s Day this year, and be sure to let us know how you are celebrating the day in the comments below!